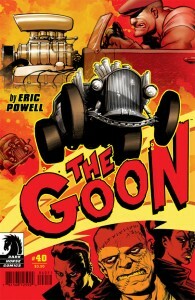 Hot rods, booze and broads are just a little bit of what this issue of The Goon contains. The story is broken up into 3 different parts. We begin with a story about prohibition and how Goon and Franky made a couple bucks off of it. Gettin’ into some trouble along the way is just par for the course and they have to take some drastic measures to clean up some messes. The middle section continues with the Goon and Franky meeting up with a down and dirty family, the Boyles, who are also peddling their own brand of moonshine. The Boyles are displeased (to say the least) that the Goon is taking away business from them and cutting in on their profits. After many attempts, the Boyle clan comes up with a plan to wipe Goon and Franky off the map and a battle royale takes place between Franky and the patriarch of the Boyles, Papa Grits. Well, that is until an unexpected “guest” show up and proposes (demands) a different contest to determine the winner. The final part of the story obviously concludes the saga and ends with an awesome homage to Ed “Big Daddy” Roth and his artwork. Like usual, this issue is solid. It’s funny and tells a great story in a very unique way. Eric Powell’s writing and art are amazing and the characters are stellar. 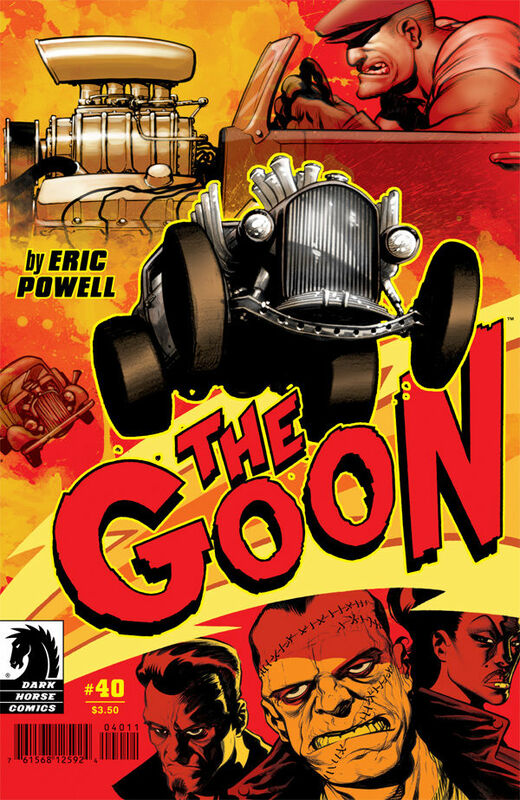 The Goon is perfection and each issue is ridiculous (in the best way possible of course). Powell continues to come up with fabulous stories and innovative ways of telling them. There’s not much more to say, it’s great, go buy it, read it and I promise you that one issue is all you need to read to become hooked on the entire series!